Working with commercial real estate (CRE) professionals for nearly a decade has given me some interesting insight into this sector of the economy. The CRE sector can sometimes seem chaotic. Over the last decade, I have seen CRE professionals prosper where others have failed. While I don’t purport to be an expert, I have had the opportunity to see what success in CRE looks like. From my perspective, one trend seems to stand out. It’s not secret sauce or something someone learns from those get-rich-quick schemes we see advertised on late night television. The common thread among leaders in CRE is that they see opportunity where no one else does. OK, that’s great, I’ve stated the obvious. But how do you do it? There is no magic opportunity wand; there is only what you know about the market. Therein lies the real secret to success in real estate—having access to information. Not just any information, however. You need information that identifies gaps in your thinking, finds results and supports decisions but is buried in the massive amounts of data. Can you see opportunity hidden in spreadsheets, big data, and the millions of bits and bytes that make up the Information Age? Maybe not. Almost every piece of data contains one of the basic tenets of CRE that can help you see these opportunities and more — location. Data that contains location-based information is everywhere these days. But again, just having access to it won’t make you a star in the CRE world. Your success is predicated on what you do with this data. Turning it into the next great idea in real estate requires mapping out your data and having a solid strategy. How do you get strategic with your location data? As mapping professionals and data scientists know, one of the most powerful tools you can use to turn mountains of data into something useful is geographic information system (GIS) technology. You may be familiar with GIS as a back-office solution used by mapping professionals, but I’m not talking about that kind of technology. Thanks to advancements in devices, networking, and the Cloud; location has become a fundamental part of our everyday lives. We use location-based technology almost every day, from navigating our way while driving or walking, to finding the stores for the things we need closest to us. Location information is embedded in almost everything, and those with the next great idea are taking advantage of this. Instead of using location-based technology in their personal lives to find their way to the grocery store, they are applying these tools to their businesses and finding hidden niche opportunities or greenfield sectors that have been hidden within the CRE market. 1. Diversify your portfolio and align it with key market indicators. Think about the key market indicators your customers want. For example, are they interested in future infrastructure? If you knew where roads and population were going to be in five years, chances are that you’d already be there. Location-based information such as demographic forecasts and highway and community plans, are widely available to CRE professionals today. 2. Develop and share information to better serve clients, tenants and owners. If you can share your insight with your clients faster and better than your competitors, your success rate is guaranteed. CRE clients, tenants and owners quickly learn to rely on the people who provide them with the best information. By leveraging location-based information through maps and apps, you provide clients with the data they could not find themselves, making you an invaluable part of their business. 3. Improve market timing for acquisition and disposition decisions. Faster is better in every business, but timing is absolutely everything in the CRE industry. Having the right information at the ready requires a plan. One of the best ways to do this is to quickly leverage the data you have through location technology. This will help you find, analyze, and share information faster than those around you. 4. Be able to provide and capture information anywhere, anytime, and on any device. Brokers are sensors. CRE professionals are constantly gathering information about the market they focus on. Put that information to work for everyone by capturing and sharing the state of your ever-changing real estate environment. Give your team a way to quickly and accurately capture location data, images, and insight from the field with simple mobile applications so you can ensure that the information easily gets to your system of record. 5. Empower, brokers and clients for better market insight. The same information you capture in the field can now be analyzed and shared back to your CRE professionals and their clients. Modern GIS technology can help you turn all this location data into actionable intelligence by providing clients with the right story about a real estate decision. Maps drive understanding, and this, in turn, drives success in the CRE industry. Let’s recap. CRE organizations rely on data, and almost of all this data has a location element. To get the most out of it, you need a strategy to collect, manage, and analyze data in order for it to become actionable information. How can you do this? 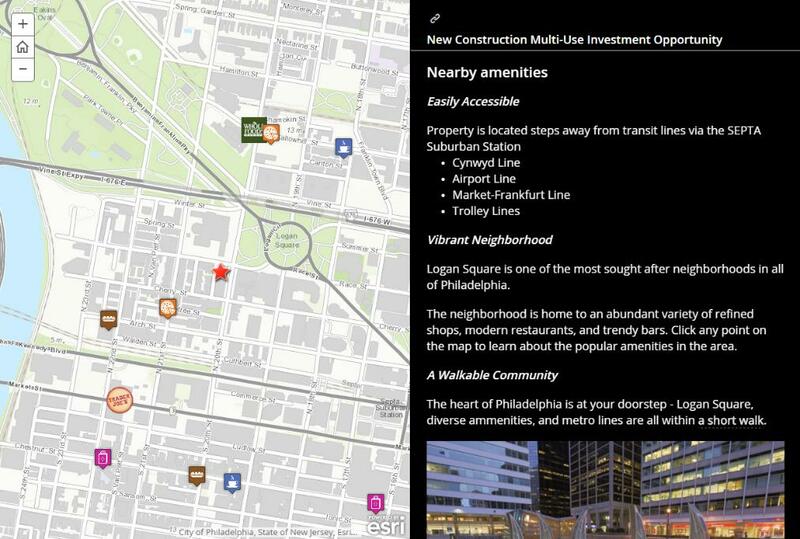 ArcGIS is the platform you need to implement a location strategy. ArcGIS allows every CRE broker and client to discover, use, make, and share location information from any device, anywhere. Talk with me and let’s make a location strategy your next big idea in real estate.